The “Zinc Superhighway” just doesn’t have a nice ring to it. Luckily, most want to use it for grid storage. SAN JOSE, Calif. --- Zinc isn’t as cheap as dirt, but it’s close, which is why it still belongs among the viable options for energy storage, say advocates. Zinc costs $2 a kilogram, according to Gregory Zhang of the International Zinc Association. The world has reserves totaling 1.9 billion tons. If you wanted to store 10 percent of the energy that will get generated by the world’s wind turbines in 2020, you would only need 2.3 million tons of zinc. The world produces 30 million tons a year. “The world will never run out of zinc,” he said during a presentation at the Energy Storage Association annual meeting last week. The material isn’t perfect. Companies such as Revolt Technology and PowerAir have touted the material for years. APET from Taiwan even showed us the Zincmobile at the Frankfurt Auto Show 1.5 years ago. (That's APET's battery in the photo.) But it’s still not mainstream. Carbon dioxide can clog the air intake, while corrosion, inadequate electroplating of electrodes, mineral degradation and electrolyte degradation remain problems too. 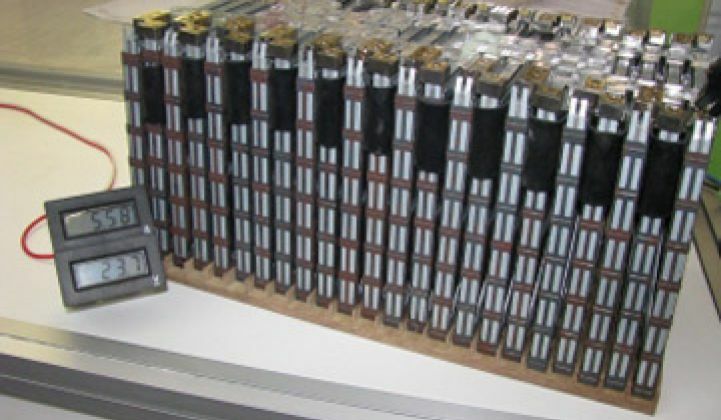 Many zinc batteries can’t survive more than 100 charging cycles. PowerGenix, which has sold nickel zinc rechargeables for a few years, has managed to get around the charge cycle issues but it's generally still an industry problem. But besides being cheap, zinc also packs a wallop of power. A kilogram of zinc contains enough energy for raising five cubic meters of water 100 meters. Energy is harvested by combining zinc with oxygen and catalysts. Zinc oxide, one of the byproducts of the first reaction, subsequently becomes a source for zinc. The zinc/zinc oxide reaction is essentially infinitely renewable. By contrast, titanium and silicon oxide reactions can’t be reversed in the same way. Iron and lead have lower energy densities and lithium and sodium, which can pack quite a bit of energy, aren’t as stable. Though the starting price will be more expensive than lithium-ion grid batteries, the price will drop to $650 and $400 per kilowatt-hour in subsequent years. The response time can be measured in milliseconds, Oster added. Regardless of whether you become a zinc nut or not (personal disclosure: I'm a huge fan of the idea), Zhang did raise an interesting dichotomy to think about when considering energy storage technologies. The market can be divided into two categories: storage technologies that depend on mechanical devices like flywheels, batteries and capacitors and storage technologies that depend on materials like hydrogen, air or chemical changes. Material storage plays will always be cheaper because capacity can be added at marginal costs. Differentiating between the two isn't always easy. Compressed air systems store energy in mechanical systems. Hydrogen needs fuel cells and zinc requires batteries. But in the case of zinc, ammonia and hydrogen, the mechanical elements mostly function as container. The energy is stored through molecular action. Similarly, the energy in a pumped hydro system comes from gravity. It's an interesting way to look at things.